It’s rare that we come across a home that has a soft touch approach to bold Bauhaus design. We’re touring an exceptional family home that does just that! The architects at Lee+Mir bring us this bold and soft design. This Bauhaus-influenced home has a smooth and nearly featureless facade. The villa sits among the hills of a growing residential area and has uninterrupted views of the city. Two defined structures blend together to form the home; the ground floor and the cantilevered structure that sits atop. Inside we’ll find spacious interiors thoughtfully laid out to support family life and inspire creativity. This home is a champion of bold yet livable architecture and we’re excited to see more homes take this innovative approach to design! The home cuts a unique form like no other. The black main floor seems to carefully balance the white structure above. Massive floor-to-ceiling windows create a close connection to the outdoors. From inside, the home offers panoramic views of the city and surrounding landscape. The rolling green hill swells to a crest and supports this impressive Bauhaus-style home. Sliding glass doors open onto the partially covered terrace and garden. The home is closely connected to this outdoor space. This is the perfect spot for outdoor entertaining and making the most of the city view. The home itself uses a palette of black, white, glass, and concrete to create an ultra modern family home. We’ll see colours and materials reiterated inside, as well. The home feels open to the outdoors, and like a work of art, it’s open to interpretation. Inside, dynamic shapes and architectural forms create a lively home. 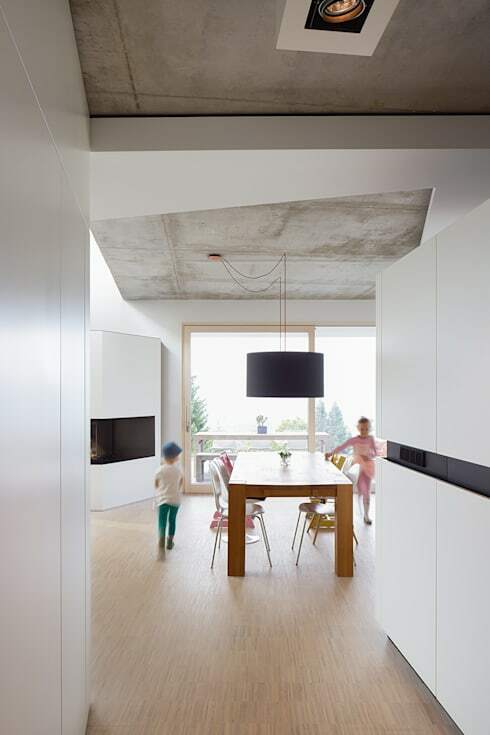 Exposed concrete ceilings play with the smooth white walls and accents in the home. Hidden storage features make the home feel futuristic. This dining room is framed by the fireplace and a pendant light fixture. These two black and geometric elements form a perfect composition together. The views from this home are spectacular! This main level is laid out in a simple open plan design. The furniture and decorative elements blend together harmoniously into the living space. 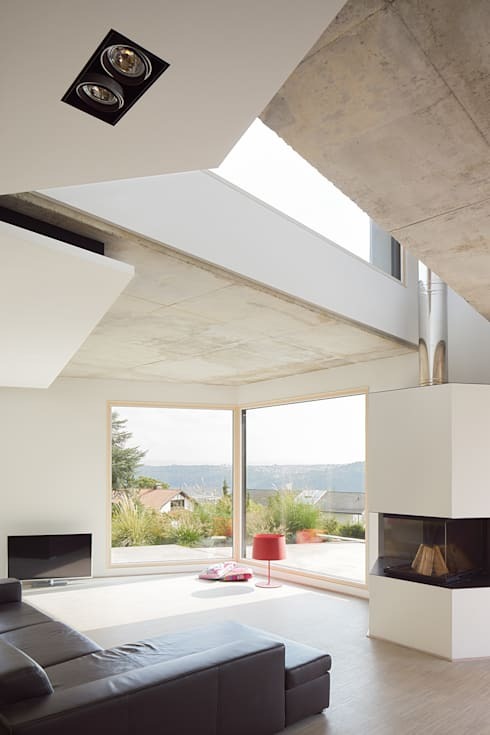 Check out the fireplace and see how it acts as a sort of room divider, delineating space within the open plan. One wall features a fresh pop of sage green, introducing colour into the design. The living area is connected to the upper level by this parapet. It helps bring more light into the living room and gives it an open and airy feel. The black leather couch is a masculine, midcentury addition to the room. It creates a spirited juxtaposition with the airy femininity of the living room. Another view of the living room shows off the design of the fireplace. The space is full of geometric lines and shapes. The concrete ceiling and shining chimney add an industrial flair to the room. Underneath this main floor, there are two extra bedrooms, a sauna, and a wine cellar in the basement. It’s a spacious family home full of visual interest. Want to learn more about Bauhaus style? Check out our feature on Intro to Bauhaus: Tour this Creative Concrete home. What did you think of the combo of bold and soft in the design?